This week’s Snaparazzi campaigns were all about employing simple ideas to produce big results. Monster Energy saw a great opportunity with World BMX Day and seized it by snapping the action as it took place across 24 hours in five countries. Using their other social media accounts to announce the campaign, they successfully guided their followers to their Snapchat, and potentially picked up some new followers who may have found their way via hashtags on the other platforms. Both IBM and Lufthansa went with a classic behind-the-scenes look at a day on the job. These sneak peaks into life as an employee can be really compelling for viewers if the work is interesting, and the content is cost effective and relatively hassle-free for the brand to create. A definite win-win! World BMX Day Happened And It Was Sick! In Celebration of World #BMXDay on July 22nd, Monster Energy launched a worldwide campaign with The Street Series, hosting events across the globe and using Facebook, Instagram, and Twitter to direct their followers to watch the events unfold on their Snapchat. The first gathering started in Melbourne, and as the sun rose in other parts of the world, another takeover kicked off in a different city. By the end of the day, they had celebrated in five countries with some BMX royalty, their fans, and hundreds of other riders. The best part? All of the events were basically giant competitions, and they were handing out sweet cash money as a prize for the raddest tricks. Using their other social media accounts to funnel followers to their Snapchat was pure genius, and this is exactly the kind of content that brings people back to your account for sick updates all day long--we certainly weren’t immune! 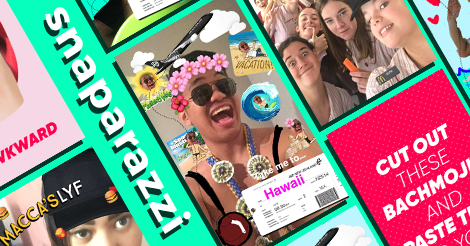 It can be hard to come up with content that can be produced quickly and easily to keep up with Snapchat’s 24-hour cycle, which also engages the very specific age demographic that tends to hang around on the app, but Lufthansa’s Crew Stories is a concept that’s really taken off. Since launching the campaign last September, the company has seen an astounding 800% increase in their Snap views, and they’ve managed to maintain those viewership numbers so far. People love it because it gives a behind-the-scenes look at life as a member of the Lufthansa cabin crew, which is endlessly interesting when you consider everything that goes into a successful flight and all the destinations they get to travel to. So interesting in fact, that they regularly receive employment inquiries via direct chats. With results like that, there’s no reason why this campaign shouldn’t carry on! IBM’s Watson seems to know everything, but what do we know about Watson? Thanks to IBM’s Snapchat story this week, followers got to tour the Watson Health Client Experience Center and office to learn a bit about how their cognitive computing system can help healthcare professionals advance their studies in oncology, genomics, and more. The story concept itself was pretty simple, but when you’ve developed what might be the most advanced AI around, you don’t need to do anything else extra flashy to get our attention. Though come to think of it, the exhibit did have some flashing lights...and we loved every 10-second segment of this tour.